This week refugees were removed from the Dunkirk settlement and taken to a gymnasium in coaches. There they queued and received a band for entry to the gymnasium (if they were lucky enough to be one of the first 180 people in the queue). The gymnasium provides a dry floor to sleep on and some washing facilities. 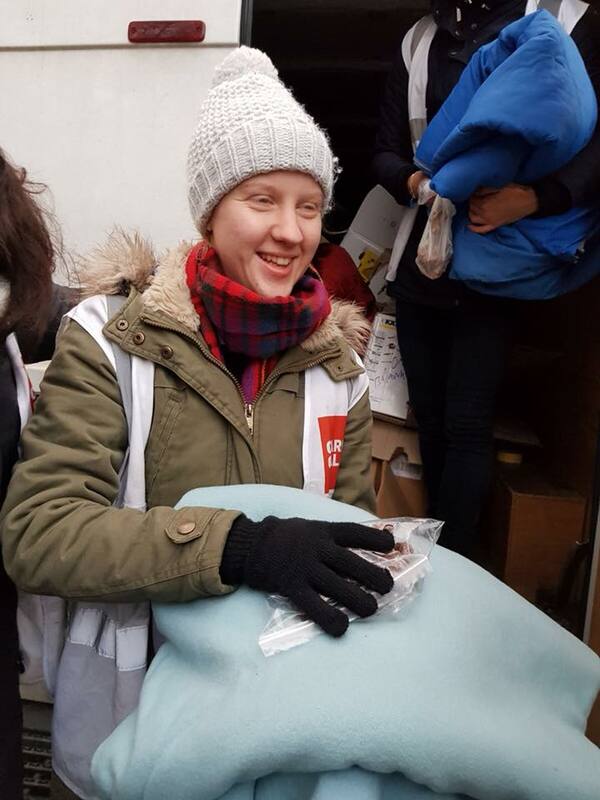 This morning we prepared blankets, individual toiletry packs, snacks and drinks and loaded up a van. On approaching the gymnasium the situation looked tense. There were two police vans and about ten armed police outside and a group of tired and stressed refugees trying to speak with security at the entrance. A few of us went to find out what was going on. We learnt that a man had bought a wrist band (which allowed entry to the gymnasium) from another man, but that he was not allowed to enter because he had a different date of birth. Alongside this, two men that did not have wrist bands had been asking to go in to the gym for just five minutes just to take a shower but they had been refused entry. The refugees told us to come and take a look around the corner of the building where two men were undressed and attempting to wash in the freezing cold temperatures. Their friends (with wrist bands) were helping them to wash whilst advising us that these men haven’t been able to shower for 30 days. They had taken off their jackets and were using them as shower curtains whilst others poured water bottles that they would go and fill up from the gymnasium. We ran back to the van to retrieve towels and asked the showerees to sit in the front of the van, providing some protection from the icy wind. They had soaking wet hair and nowhere to go or to sleep. Half of the volunteers worked on bringing the toiletry packs through the back entrance of the gym. The other half gave out snack packs and drinks to the groups at the front and began chatting and the atmosphere soon started to relax and improve. The gymnasium consisted of a large hall for the men, a smaller room for woman and children, and some toilets and showering facilities. Blankets outlined the hall and exhausted men sat slumped against the walls. In the women and children’s room, the women had used tables to separate sections and provide some kind of privacy for each family. Although not ideal, the gymnasium could be life saving in contrast to the freezing cold temperatures the refugees face when sleeping outside at night. We hope that the provision of this facility is not an excuse for the police to tighten their control and brutality when moving refugees on. The gym facility only has the capacity for 180 people and we estimate that there are almost double that number of refugees living in Dunkirk.